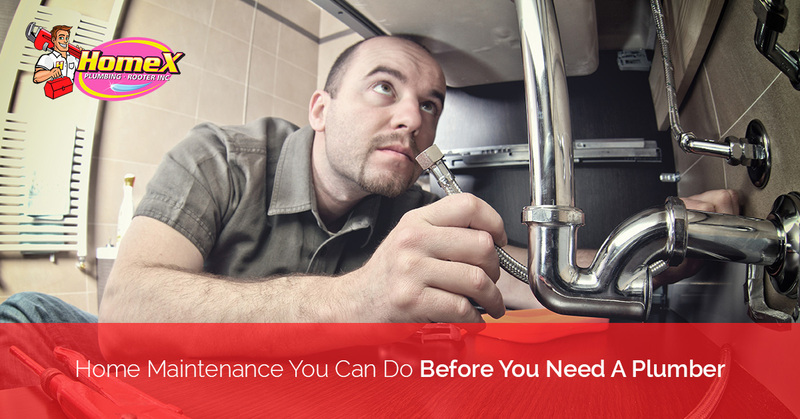 Home Maintenance You Can Do Before You Need A Plumber | HomeX Plumbing & Rooter Inc. Living in the Golden State, we don’t have to worry too much about winterizing our homes for sub-zero temperatures. But much like the rest of the country, everyday wear and tear can cause major issues to integral systems within our homes like our pipes and plumbing. If left unchecked, these issues could snowball and create a big plumbing problem for you and your family. But not to worry, HomeX Plumbing is here with a helpful blog that’s chock full of helpful hints that are sure to save your home from a plumbing disaster. Remember that leaky kitchen sink that just keeps dripping and dripping, which always keeps you up at night and haunts your dreams? Well that leaky faucet could be costing you quite a bit of money. When left alone, a faucet that leaks approximately one drip per minute for an entire year will waste about 35 gallons of water. No matter how low your rates are, that’s sure to be a lot of money to spend on water you aren’t even using. Old or broken garbage disposals can also cause problems in your home. If the blades aren’t sharp anymore or there’s something wrong with the motor, you could get a lot of clogs in your sink, which may lead to leaking and broken pipes. Fixing your sink can be really easy. Check and make sure your sink’s handles are fully tightened. If they’re not, tighten them with a wrench, but be sure not to damage anything in the process. Do the same with the faucet and pipes that are attached to it below. If your garbage disposal isn’t working properly, we suggest calling your friendly Buena Park plumbing experts to help you figure out the problem. But if you’d rather do your own maintenance, look for the warning signs: constantly having to run the disposal and for longer periods of time, constantly having to reset your disposal, the frequency of your clogs are increasing, or foul smelling odors that won’t go away are just a few indications that you may need to replace your garbage disposal. Though you can’t always see them, pipes are a very important system in your home. Not only do they bring fresh, drinkable water in, they take used, possibly harmful water out. Most pipes are built into your walls or can be hidden under floors, making them very hard to check and maintain. If you think you have a clog in your pipes, you can always use commercial cleaners you can find in any store to possibly get rid of the problem. If you have a large concentration of lime in your water and notice a build up of limescale, you can also use commercial cleaners to get rid of the problem where you see it. Or you can take care of the problem at its source. Empty half of your hot water heater, add the lime remover to the tank, and then refill the tank back to its regular capacity. Make sure to run the hot water until the lime remover is completely out of the tank, which you’ll notice when the water is clear once more and no bubbles or foam come through shower heads or faucets. But like most impending natural disasters, if your pipes need to be replaced by a professional, there will be warning signs. For instance, water spots or marks on your walls or ceilings could indicate leaking or broken pipes. Major decreases in water pressure or quality could mean that there’s something in your pipes or that they may be eroding and need to be replaced. Gurgling or unnatural sounds and smells coming from your pipes is also an indication of a problem that should be inspected by a professional plumbing company. You may not know it, but your toilet can be costing you quite a bit of money, even when you aren’t using it. It’s well known that, when flushed, toilets use a lot of water. But even low flow toilets can cost you money if they’re constantly running much like a leaky sink. To combat this, check the water pump in the top as well as the chain and stopper to make sure they aren’t at fault. You can also double check to make sure something isn’t going on with the water line, which is usually found at the base or behind the toilet. And though it may be hard with curious little ones constantly throwing objects in, make sure to only use your toilet as it’s meant to be used. Nothing other than human waste and toilet paper should be put down it. Even if a product says it’s flushable, it may not deteriorate like toilet paper and get stuck in your toilet or cause a back up in the sewer. You can also reduce the likelihood of your shower clogging by reducing your use of oil-based moisturizers in your tub. Oil-based soaps and moisturizer can mix with hair, dirt and other debris to cling to the inside of your pipes, causing major backups and clogs. You can also install a screen over your drain, which will prevent hair and other large debris from getting sucked down and creating a clog. The professional plumbers at HomeX Plumbing hope this blog has helped you if you’re looking to do your own at home plumbing. If you do require plumbing services in Buena Park, your local plumbers are always here to help. See what services HomeX Plumbing can provide for you, learn more about HomeX Plumbing, or get a free estimate for your plumbing service today!